In 1842 the first institution of significance constructed in the North Melbourne area was a cattle yard at the corner of Elizabeth and Victoria Streets (now the Queen Victoria Market). In 1851 a Benevolent Asylum was built between Abbotsford and Curzon Streets, straddling Victoria Street and thus partly in North Melbourne. The opening of the asylum coincided with the Melbourne Town Council's overtures for a new township to accommodate the gold-rush population influx. 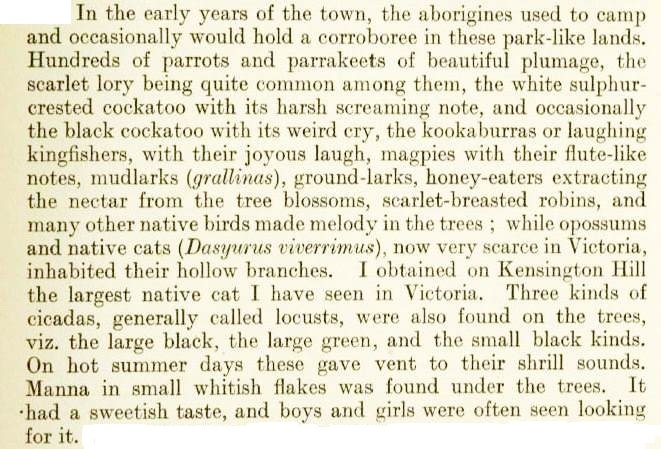 A site for the township was found by severance from an open-space reserve of 1035 ha that had been approved by the Governor of New South Wales in 1845. The result was a smaller reserve – now Royal Park – and a township called Parkside which now comprises North and West Melbourne. Town allotments were put up for sale in September 1852. North and West Melbourne were made the Hotham Ward of the Melbourne Town Council. (Hotham was Lieutenant Governor and Governor of Victoria, 1853-55.) On 30 September 1859, the area was proclaimed as the Hotham borough. By 1861 the borough had a population of over 7000 people. In addition to the churches and the benevolent asylum, it had numerous hotels, which by the turn of the century numbered over 70. By then the North Melbourne railway station was a junction for the lines to Sunbury, Williamstown and Geelong, and Essendon. North Melbourne was a working suburb, with employment in local industries and houses within walking distance of work. The population formed the North Melbourne Football Club in 1869 which became a foundation member of the Victorian Football Association in 1877. One of the prominent entrepreneurs in North Melbourne was John Buncle (1822-99), who started his Parkside Iron Works in 1853. His business in Wreckyn Street expanded to agricultural implements and household ironmongery. A founding borough councillor, his name is commemorated by Buncle Street. On 30 October 1905, North Melbourne town hall was amalgamated with Melbourne city. In 1890 tramlines ran along the eastern sector of North Melbourne and along a dog-leg route as far west as Abbotsford Street. They traversed the areas of earliest settlement, leaving the more westerly part available for industrial occupation. A gas works was opened in 1890 opposite the football ground. The football oval, however, was within walking distance for local supporters who gained a reputation for ardent barracking. The concentration of population in North Melbourne produced some congested housing conditions. During the 1930s the slum reclamation movement recorded instances of houses in lanes off lanes, in one case receiving ten minutes of sunshine a day. In 1940 the Housing Commission declared a slum reclamation area of 2 hectares between Molesworth and Haines Streets. War intervened before much physical work could be done, but by the 1960s the Haines Street estate was built and the high-rise estate at Boundary Road and Melrose Street completed. The Boundary Road primary school (1883) doubled its enrolment. The general pattern of land use in North Melbourne for most of the twentieth century was general industry along the western (Moonee Ponds) sector and the southern (Victoria Street) sector. Taking North Melbourne as a triangle, the residential sector is along the middle and the third boundary (Flemington Road), extending into the triangle to the gas-works and football ground sites and to the vicinity of the town hall at the corner of Queensberry and Errol Streets. The residential area was well located for walking to work. In the 1960s about one third of North Melbourne's land was residential. During that decade self-contained flats increased more than threefold, mostly as Government-owned units. Because of its proximity to central Melbourne, North Melbourne was affected relatively early in the gentrification process as younger, usually better-off people displaced the postwar migrants. The new population, however, did not have an up-market effect on the Errol Street shopping centre which continued a slow decline in prosperity and variety of outlets. Residents had the nearby Queen Victoria Market for food buying, and Errol Street's food retailing became increasingly of the take-away kind during the 1980s. It did not achieve the smartness of the Lygon Street eateries strip. A small Housing Commission shopping centre, near the Melrose Street flats, however, maintained an active range of retail uses. 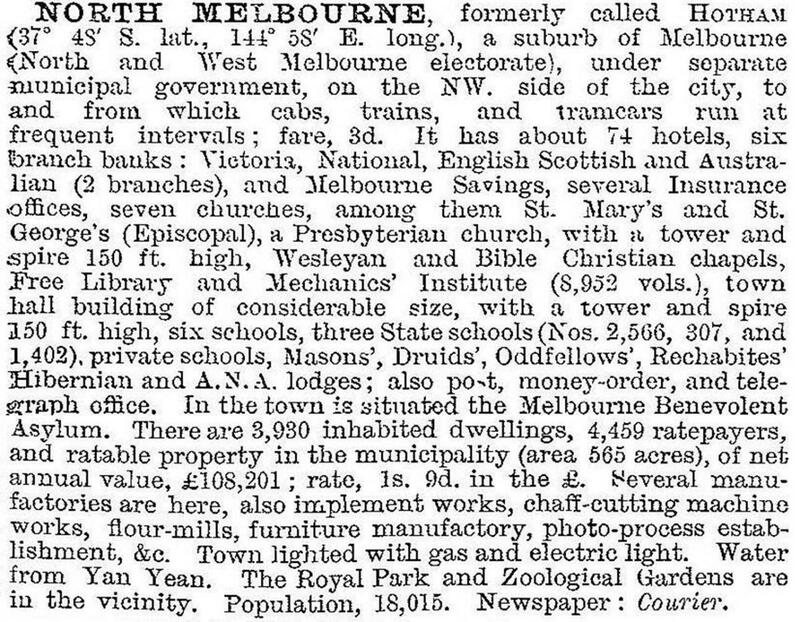 At the turn of the nineteenth century North Melbourne had three State primary schools and at least two Catholic schools. North and West Melbourne had four State and at least three Catholic. By 1996 only the Errol primary school remained as the surviving State school, but the Catholic school system maintained a strong presence, locally and regionally: the Mercy Sisters St Aloysius girls' school (1887), the Christian Brothers St Joseph's boys' school (1903), St Michael's primary school and the Simmonds Catholic boys' college in Victoria Street, West Melbourne. The North Melbourne Football Club, after winning six Association premierships during 1903-18, joined the League and languished near the bottom of the ladder until winning premierships in 1975 and 1977. Others came in 1996, by when the Club had forsaken the Arden Street oval as its home ground, and the gasometer wing was a distant memory, and again in 1999.